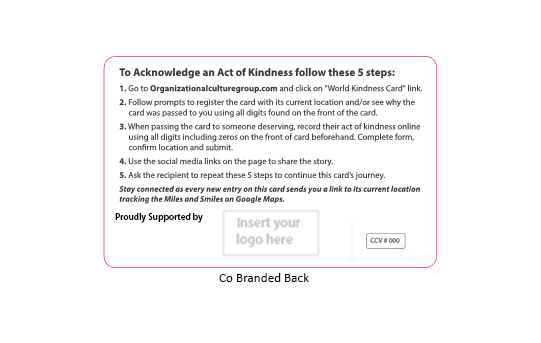 To place an order World Kindness Cards, please fill out the form below or we can direct you to our nearest retail or hospitality partner for individual orders who have agreed to be a an Official WKUSA “Kindness Point of Collection” for generic cards shown in image. Or we can direct you of to our School and NFP partners who may have cards available should you wish to support their cause. Rates for Corporate Social Responsibility and Human Resource initiatives. Note: Packaging and handling costs may apply. Special Wholesale Rates apply to our Corporate Members subject to meeting conditions. NOT JUST A PLASTIC CARD. Pay by monthly installments for orders over 5000 cards. Bulk orders can be relaeased with part orders of 1000+ cards per month, allowing you to update artwork for each release to promote a specific cause. 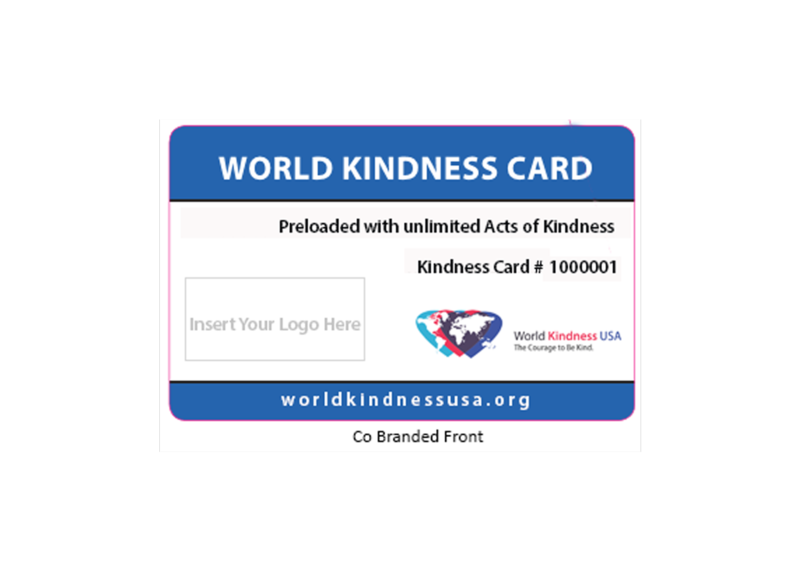 Flyers to attach to cards : DL flyers your organisation wishes to attach the cards to, must be approved by WKUSA; include the WKUSA logo and the wording “Proudly Supporting World Kindness Australia” or “Official Member to World Kindness USA”. PreRegister: Have all your cards pre registerd with a specific message from the CEO and point of origin. Load Prizes: We can load a prize or prizes onto random cards with participating retail or restaurant partners which can be redeeemed on presenting the card to a particular WKUSA retailer. Celebrity Card: Cards can be auctioned when registered by celebrities who provide a bonus surprise when the card is not kept as a souvenir and passed on. Gift the cards to a charity or school and only pay $3.00 per card the school and or charity onsells cards for $5.00 costing them zero. 100% goes to Goodwill with out any expense paid to a middleman. Your initial investment of $3 raises a total of $8 all going to create a kinder world. 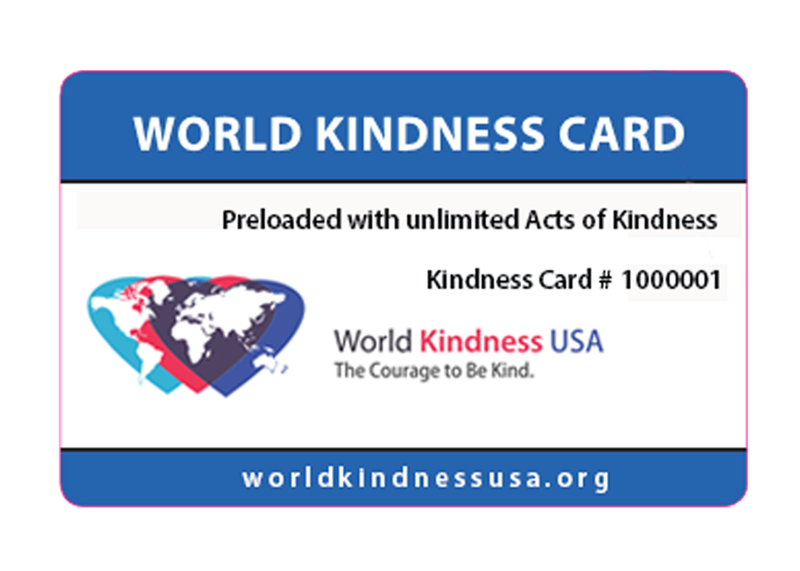 To place an order for World Kindness Cards, please fill out the form below. We will contact you with further information about customisations you may like make to your cards.